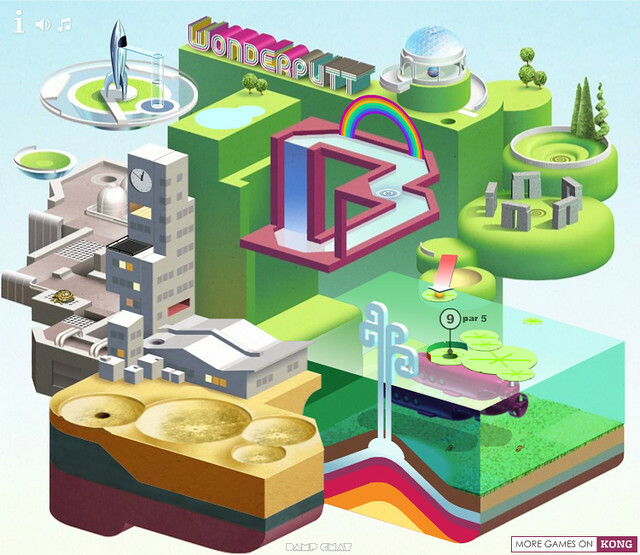 What you see above is the entire 18-hole minigolf course that you play through in Wonderputt, a whimsical new casual game from Damp Gnat. The animation and audio matches the quality of that static screen – it’s lovely. The ball-handling is nothing to sniff at, either! Check out Wonderputt’s development log for some interesting work-in-progress screenshots and concept art. Whoa! First I thought how simple this is, but it turned out to be a design-beast. Like!! Very, very nice crazy golf game. I love new unexplored gameplays like this one! minigolf, yaaay! Heh, this is cool. Great design. It’s a very nice game, but the gameplay is hardly new or unexplored. Just look at Kolf or Gopher Golf for some PC examples. Or Mini Putt for the C64 if you want to go back even further. I played this on Kongregate yesterday and fell in love instantly. I have no idea how it works… how do the physics work in that 2D world? Oh my god… This is too pretty to be true. Or Marble Madness, if you want to get that cool song stuck in your head. doo doo doo DOOO doo doo, DOOO doo doo…. Beautiful visual style this guy has… Even his site looks fantastic. This reminds me of a minigolf game that came out a couple years ago — basically the exact same but with the world made of/covered in ads… it was a pretty cool concept. I played through a round yesterday, and was blown away. Fantastic style and the way the course morphs about after each hole is very reminiscent of the “GROW” series. Perhaps these two should do a collab. That would be awesome. Ha, I’m glad I’m not the only one who thought of GROW! Anyway, this is a fantastic little game. Be sure to check out this guy’s other game (Icycle) too. It’s just as stylish and just as brutally difficult. Also, @@google-a430c43b959a351831537815a5f7754a:disqus : This guy made Adverputt too. I definitely thought of Grow when I saw this, I love the art style. 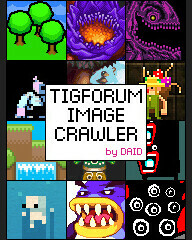 I’ll have to go give this a play on Kongregate, I’ve heard good things about in on the FGL forums, and here as well. I remember that, too! I think that, and the game before it (“Micro Putt”) are all made by the same people as this. Right, because miniature golf needs to be a complex RPG with a deep story, involving characters, and carefully balanced stats. This game is a work of art. Beautiful in style, visuals, and presentation… And it’s actually quite creative and interesting considering it’s just mini-golf. Most enjoyable 5 – 10 minutes of my week. Eh. I can’t find the ball on the first hole. Am I missing something? Yeah you must’ve missed it somehow. The ball on the first hole is in the smallest crater created by the meteors; The one in the SE of that region. Thanks. There must have been some problem with my laptop. I didn’t see any meteors at all. Tried it on another PC and it worked fine. Cute game. Did anyone else notice the impossible shape of the center course? Wow, the color scheme is amazing, Im LOVING this game! I felt that was the game’s weakest point to be honest, I mean I could’ve picked those colors myself, they’re right there in the windows color picker in MS Paint. Note to self: play more flash games. Will drastically improve quality of life. The avatar’s not me, I mean. I am actually a beautiful man of more than five colours, in real life. Ladies love me. Why do I keep doing this? I don’t know. I’m going to have a sit-down with myselves so we can all talk it out. Pretty sure it’s Derek Yu’s fault. Case study in YOUR MOM. Is anyone out there? Mom?